.LAT is the domain that was created to easily identify Latino individuals, organizations, causes and projects on the Internet. .LAT is the TLD that provides Latinos, and those trying to communicate with them, the possibility of having an Internet presence with a clear Latino identity. Latinos are an emerging market with high growth potential around the world. The entrepreneurial profile of the latest Latino generations has helped them increase their financial capacity and purchasing power. This being reflected in the continuous increase of online shopping. Latin Americans are known for keeping a strong connection with people of the same origin and traditions; also is important for them to keep their cultural identity. Therefore, they easily relate to people, organizations and brands they identify themselves with. Establish an easily recognizable domain (gTLD) that can identify Latinos on the Internet. Ease the communication between, and to, Latinos on the Internet. Spread the pride of being Latino across the world through the Internet. Have Latinos adopt .LAT as the domain that identifies them on the Internet. The .LAT will exponentially multiply the projection of Internet presence of all of those that are Latinos or want to communicate with them. 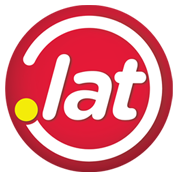 This will make the .LAT domain a powerful support tool for people and organizations to reach their objectives.